New Age Music Reviews is an independent music review service contributer to ZMR. Click here to learn more about them. 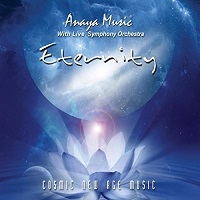 Anaya Music and the latest release titled Eternity is all about collaboration. Anaya Music is Anaya, Tania Mara Botelho, Steve Salani and members of the Prague Symphony Orchestra. I am one of the first to admit you cannot match the experience of being at a concert as to sitting and listening to CD. There are instances in my listening experiences inside the confines of my home that have elevated my spirit and given me positive energy and hope. Eternity turns out to be one of those instances. The parts from the orchestra are live however, so we get the best of both worlds. This is where technology and live off the floor music collide to explode into sights and sounds that will stir your soul. What I found interesting was how the use of technology made this project come together. Over the oceans these artists added their parts and eventually it became a whole. With the help of many talented people and the sum of its parts scattered about the globe coming together through the advances of communication and modern recording, this became a musical entity. It truly is amazing how all of that works. It is even more of a celebration when it all meets to make the most beautiful and picturesque sounds and colors arriving through your speakers. Anaya ends the liner notes by saying “Our best instrument is the universal harmony of being.” That one thought and the vibrations it creates is the perfect lead in to this cinematic recording. The soundscapes shaped and molded are things of beauty and grace that can take your spirit to a higher plain. I do believe that is the intent of music like this. Enlightened spirits leading others down the path of light and love…it works well if you allow the music to transport you as the pressures of the world melt away. The entire listening experience was so enjoyable and uplifting that I felt disappointed that it ended and it seemed to end much too soon. From where I sit that is the highest compliment I can pay to any artist. Eternity is a blessing to all that will hear it so make sure you give it a few spins and find what I found inside the music.